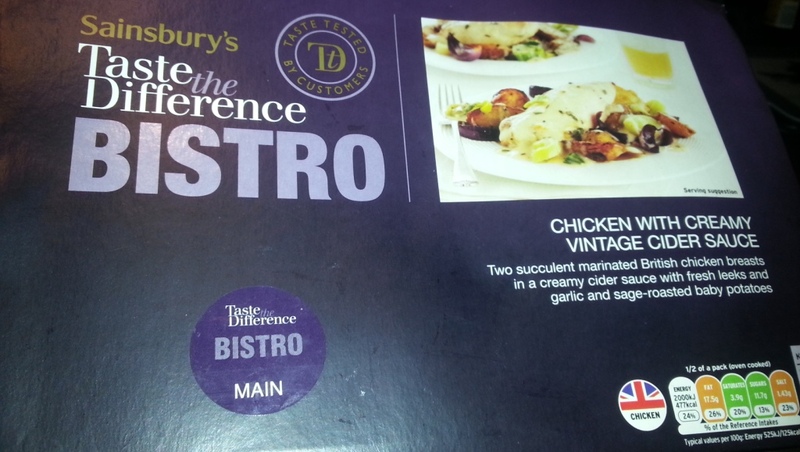 This is a weak one for the Strictly Suppers theme as the salsa was the accompaniment but it’s all I’ve got this week. 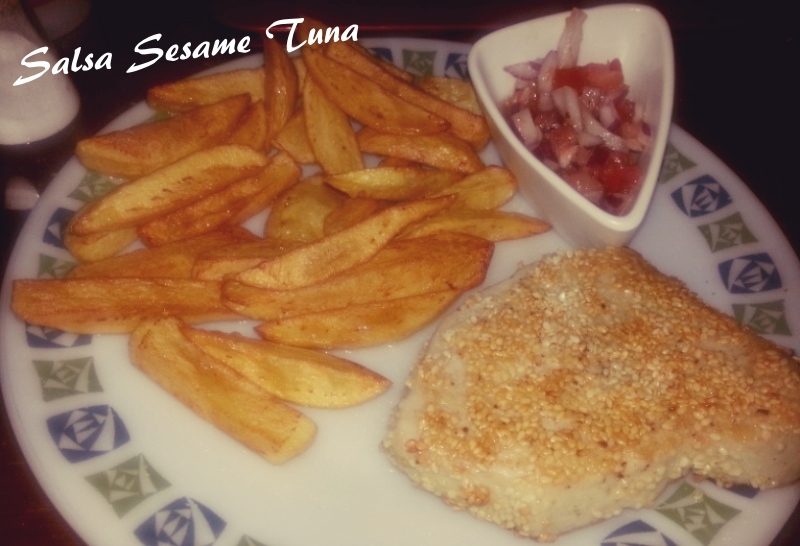 I’ve always wanted to try sesame crusted tuna but never got round to it, so I could think of no better an opportunity than to try it out for my blog. I made this on a Tuesday night, for those of you who don’t know I play pool on Tuesday’s so I usually pushed for time, if I can prepare and cook it after coming home from work and before I go to pool then it’s fairly easy and straightforward. The highest scoring celebrity Salsa this year was Jake Wood (Max Branning from Eastenders) who scored 35 while the lowest to date was Thom Evans who scored 25, both of these happened in week two. 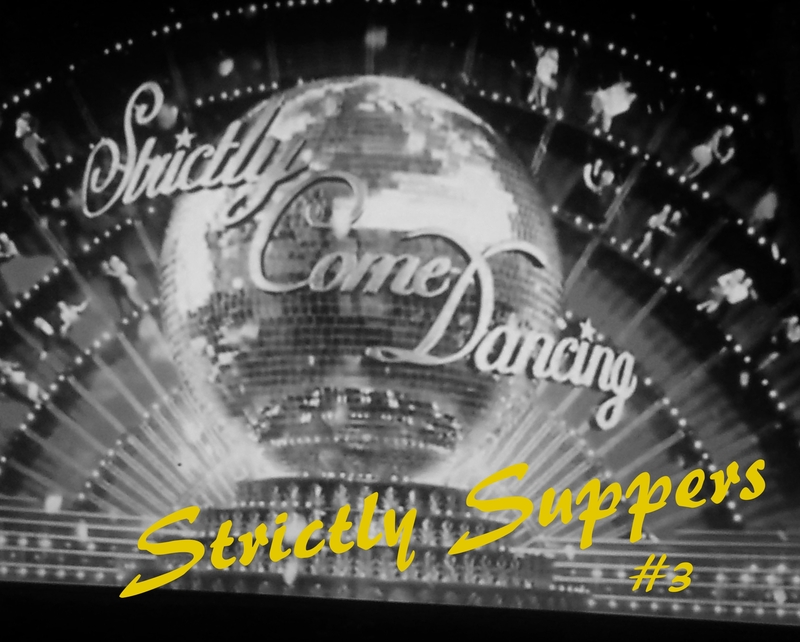 If you hadn’t guessed already I love Tuna, and I love Strictly so this was a marriage made in heaven. 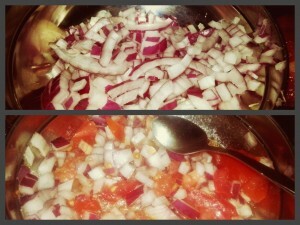 The first thing to do was prepare the Salsa. 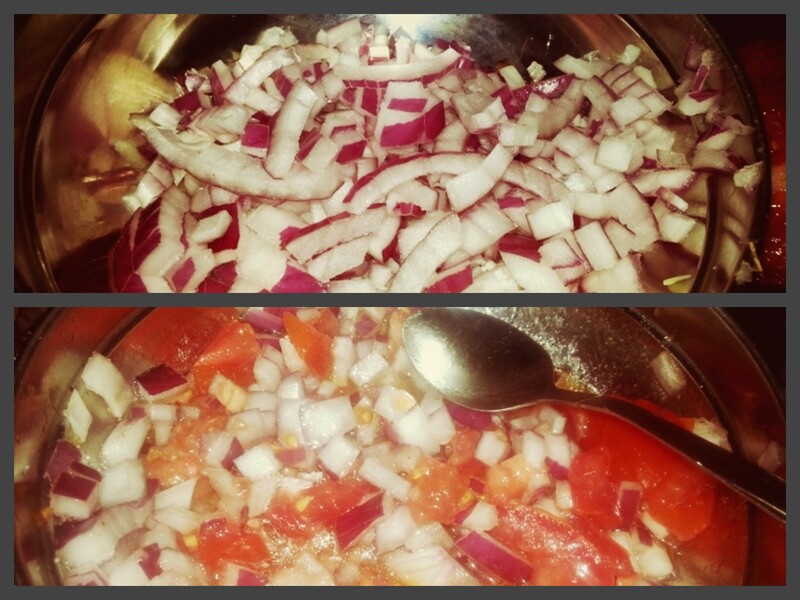 I made a basic one for this recipe because it was quick and easy, I finely chopped the onion and then the tomatoes…. keep them as course or as fine as you like. 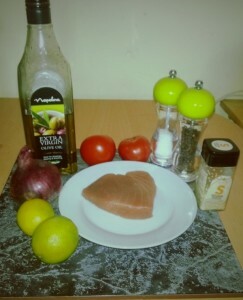 Season with salt and pepper and add a good glug of extra virgin olive oil and the lime juice. Tomatoes can take a lot of pepper and salt so be generous, but remember to taste as you go along. Some people add sugar to tomatoes, I don’t, why, because I don’t like it lol! In the past I’ve added chilli flakes, spring onions, chives lots of different ingredients to perk up a normal every day salsa. If you want to make different types of salsas check out the BBC Food website set this aside for later. 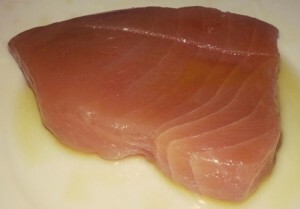 Now it’s time to cook the fish, put a frying pan on the hob and heat it until it’s very hot. This is important as it makes cooking the fish easier (in fact it makes cooking most things easier 🙂 ). Place the fish in the frying pan and fry for two and a half minutes (2:30) on each side (or as much or as little as you like). The fresher the fish the less time you have to cook it, if the fish is fresh from a fish mongers then you can serve as rare as you dare! As you can see below I have served the salsa and the tuna with my mother’s chunky chips, you could use fried potatoes or some polenta. 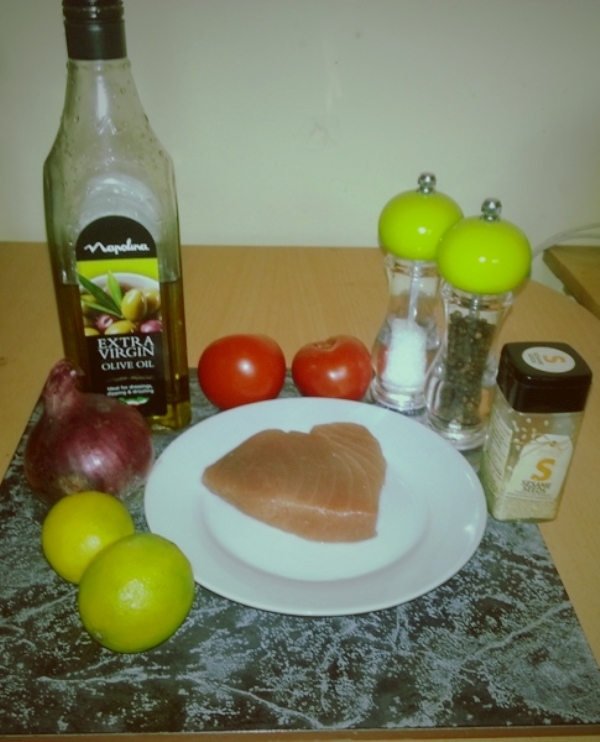 This was a great little quick and easy mid week meal and with the lime juice in the salsa it was very fresh and zingy. My mother makes the best chips ever, my nieces and nephews love my mother’s chips and so do I so there was nothing else I could serve with them. 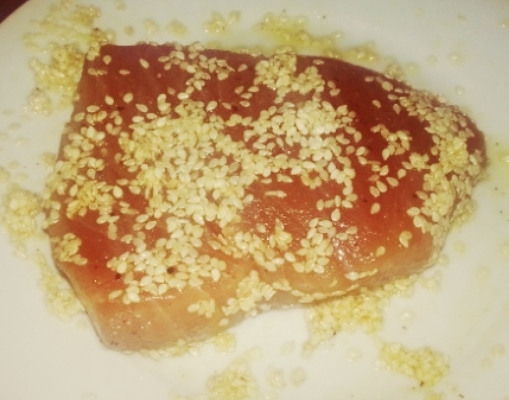 I absolutely love sesame seeds so I’d imagine this tuna tastes delicious. I agree with you about adding sugar to tomatoes, they’ve plenty of natural sugar already so don’t need any more. 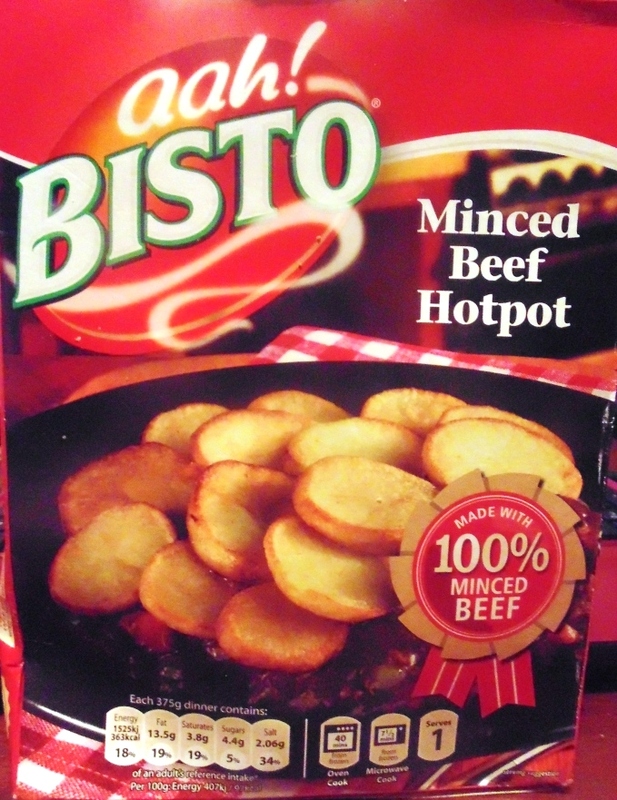 Sounds like a fab meal – and those chips look amazing! 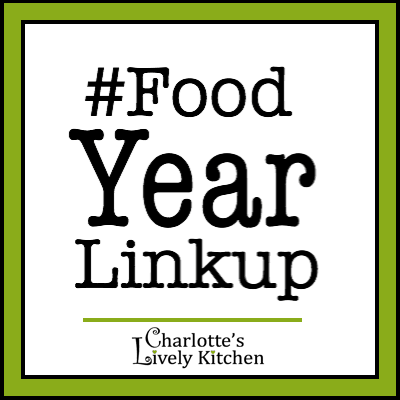 Thank you for linking up with the Credit Crunch Munch (but tuna is expensive?!) so I’m assuming it’s the salsa you’re meaning? Could I ask that you update your post to include a link back to the challenge page as hosts (as per the rules) and in the future only link up recent recipes? Of course I’ll link up the challenge page, do you have a badge? I’m sorry I didn’t realise all the rules. Oooh, you can’t beat a shop of post fish and chips can you?! Lovely.